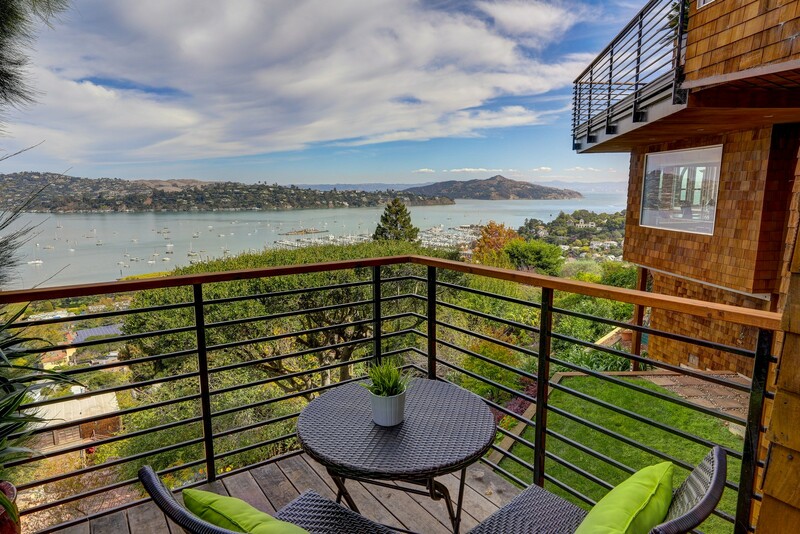 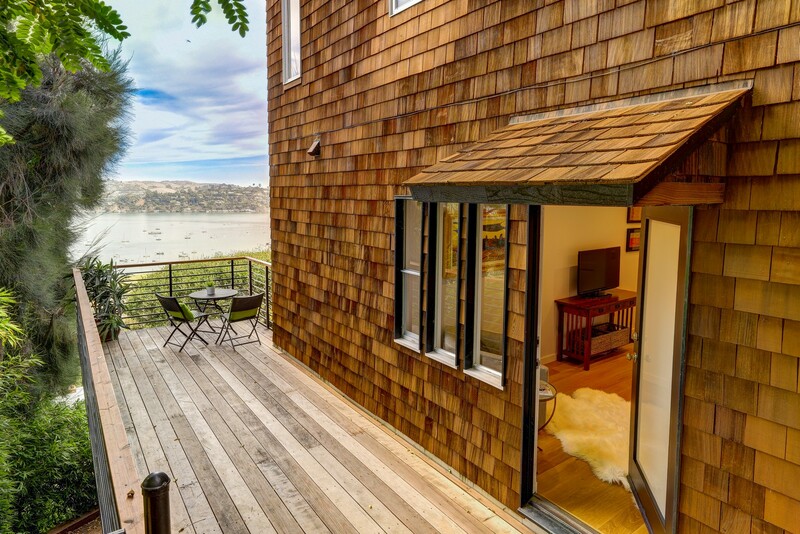 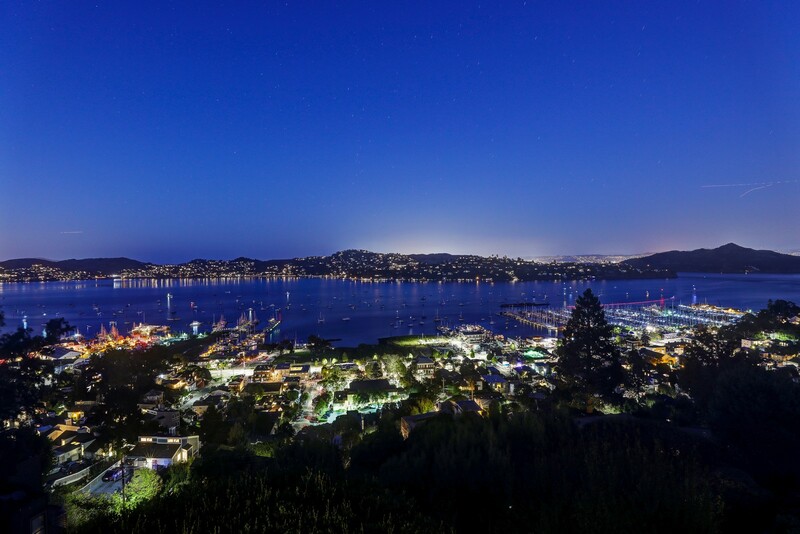 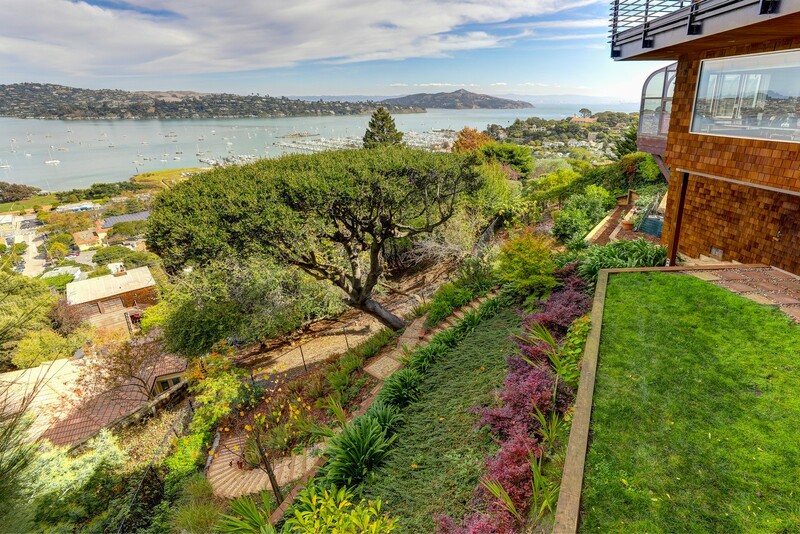 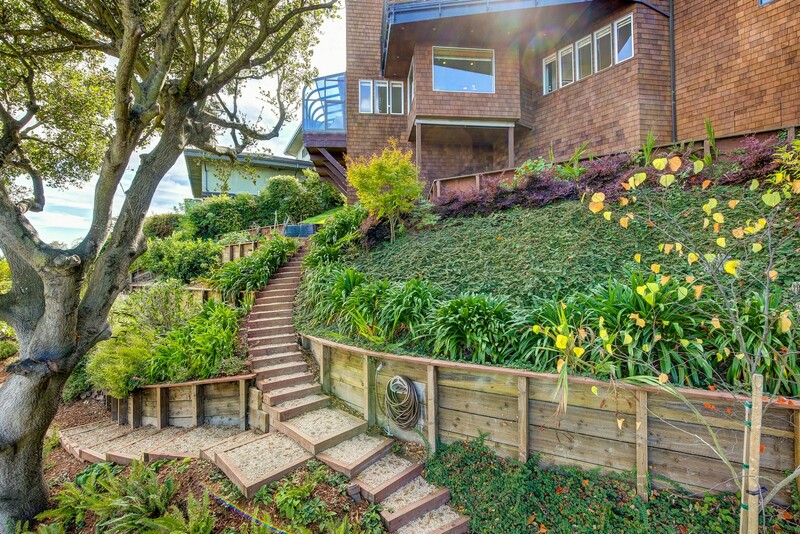 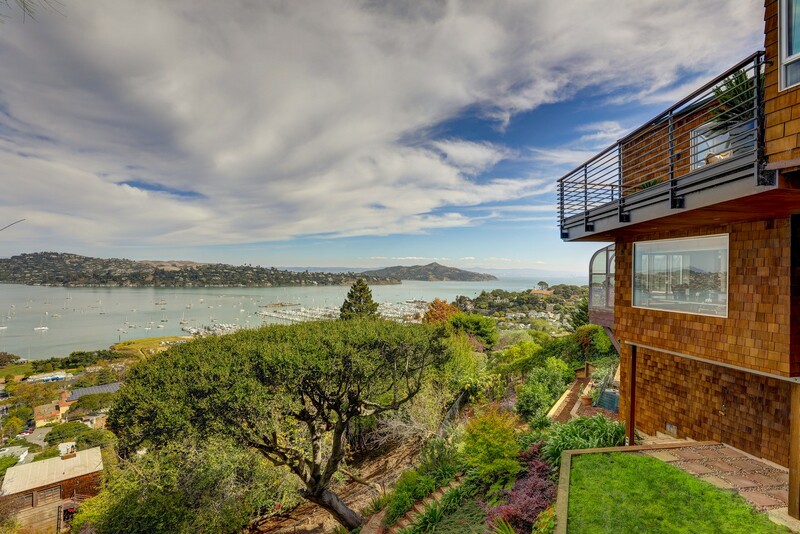 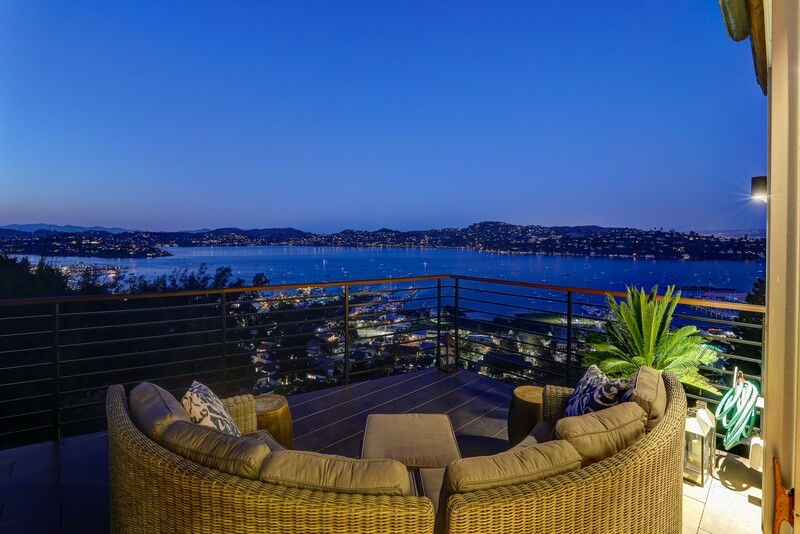 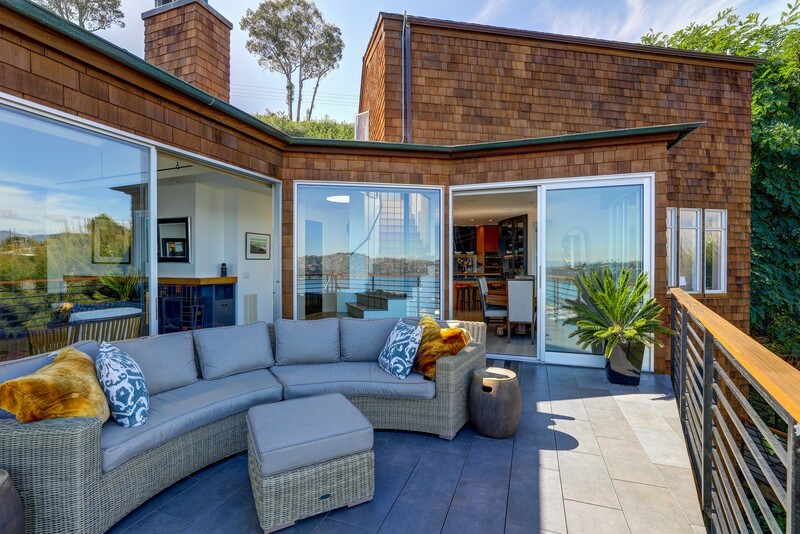 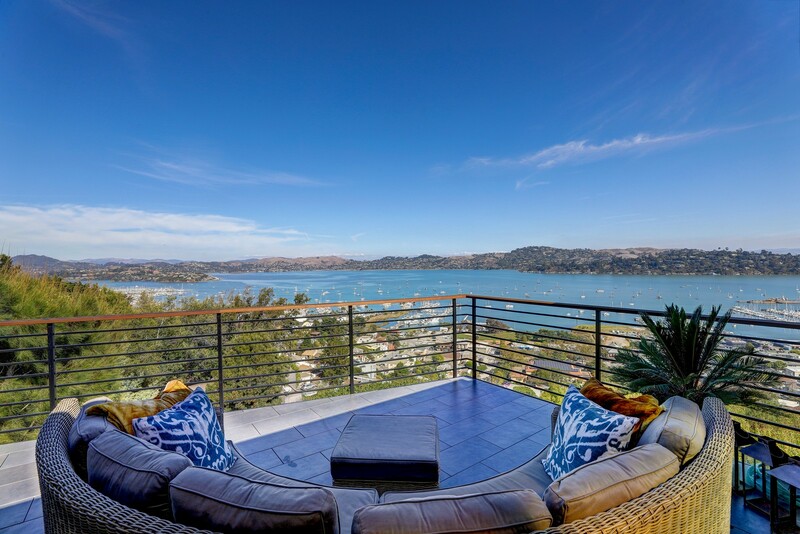 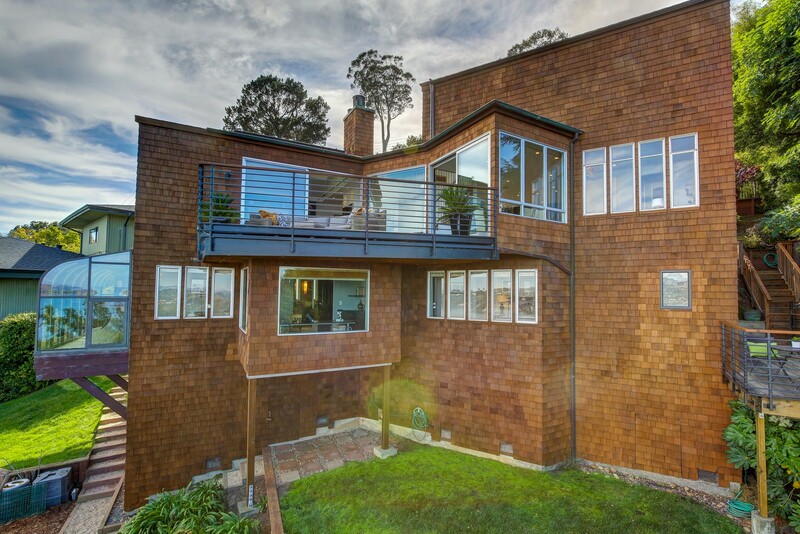 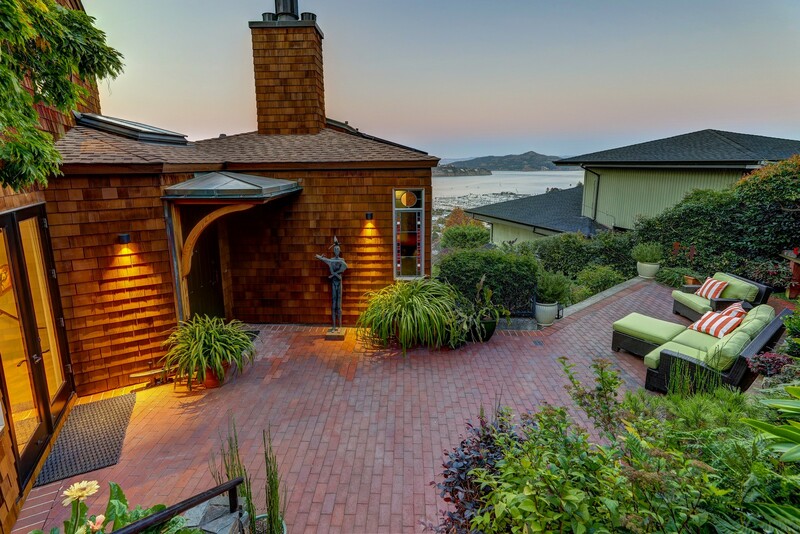 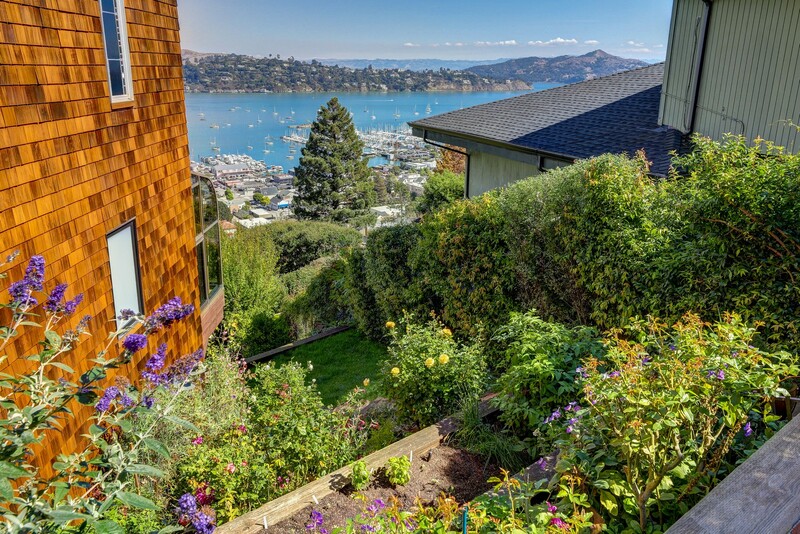 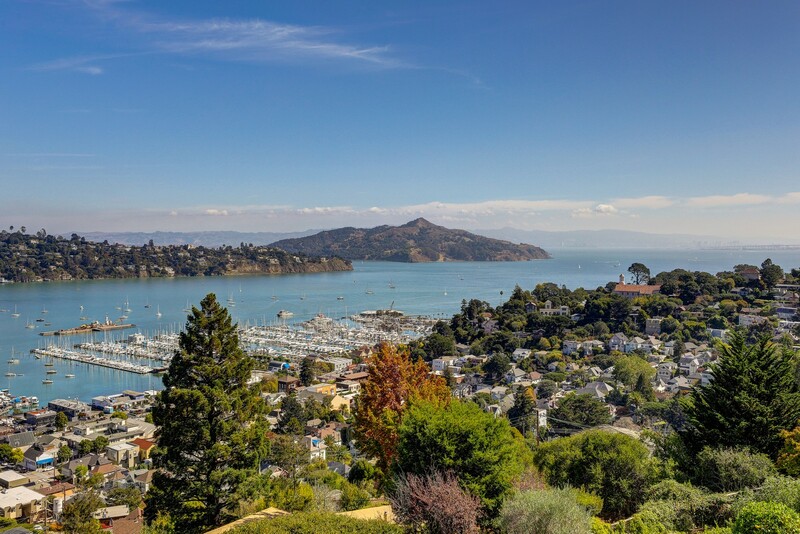 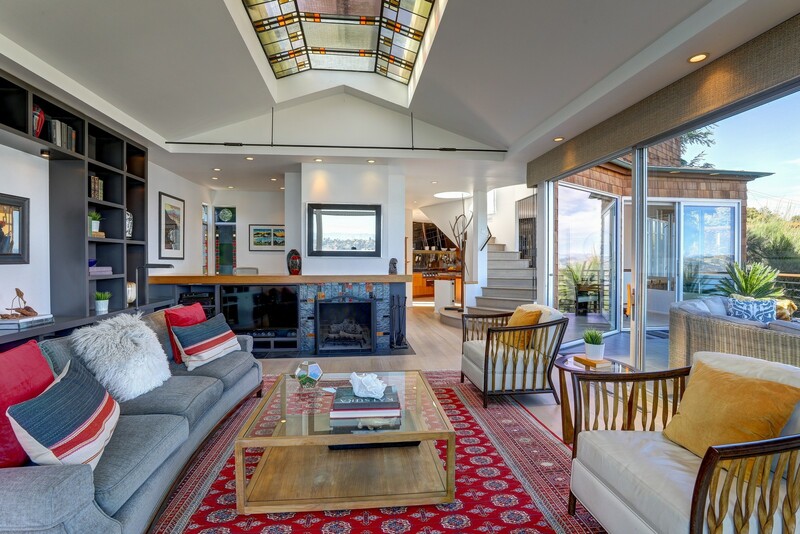 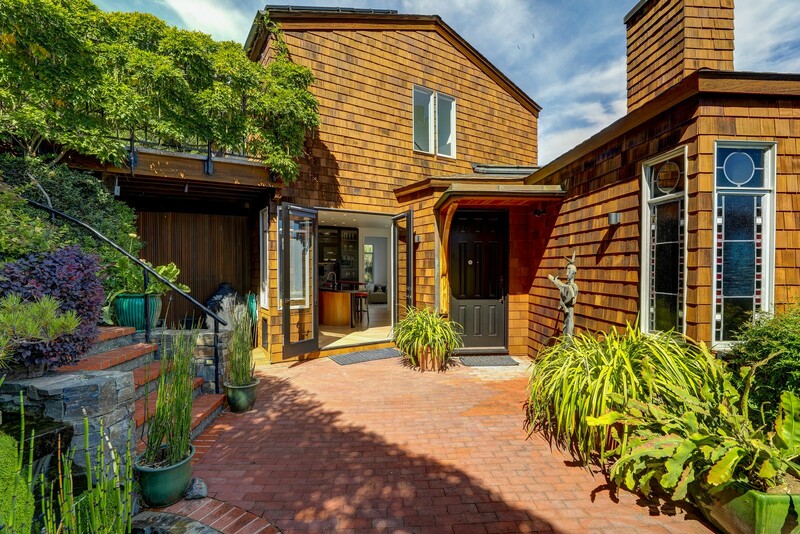 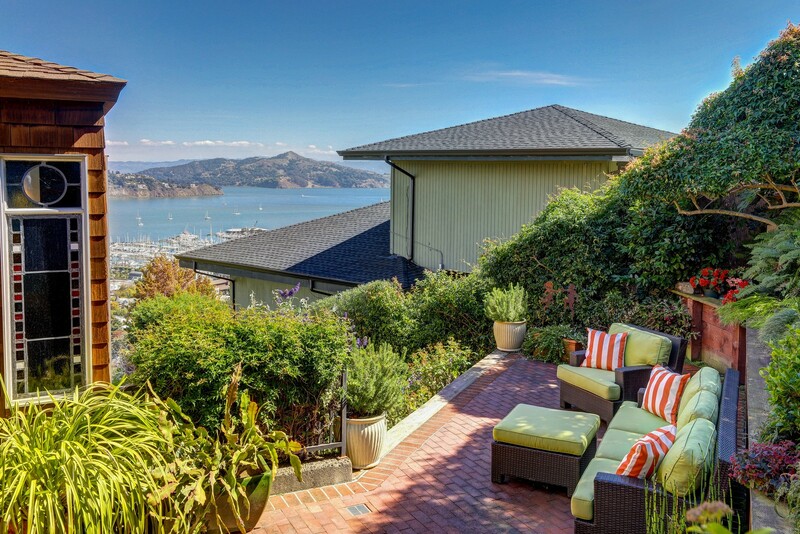 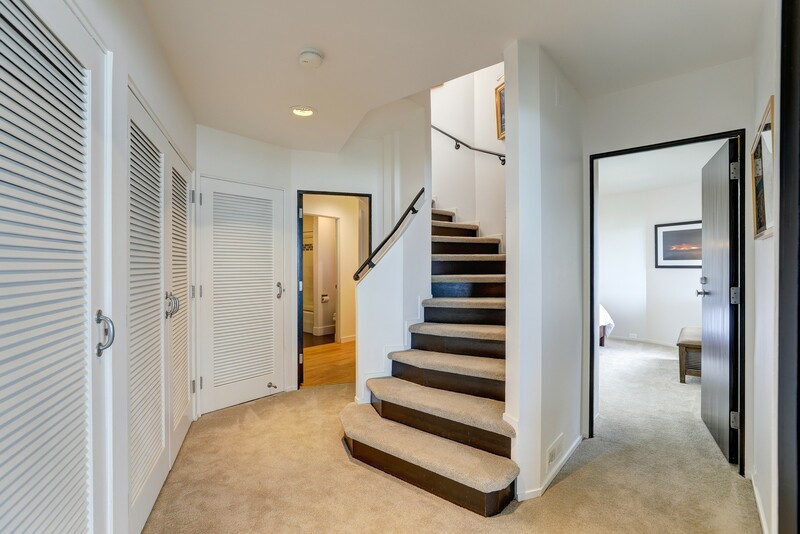 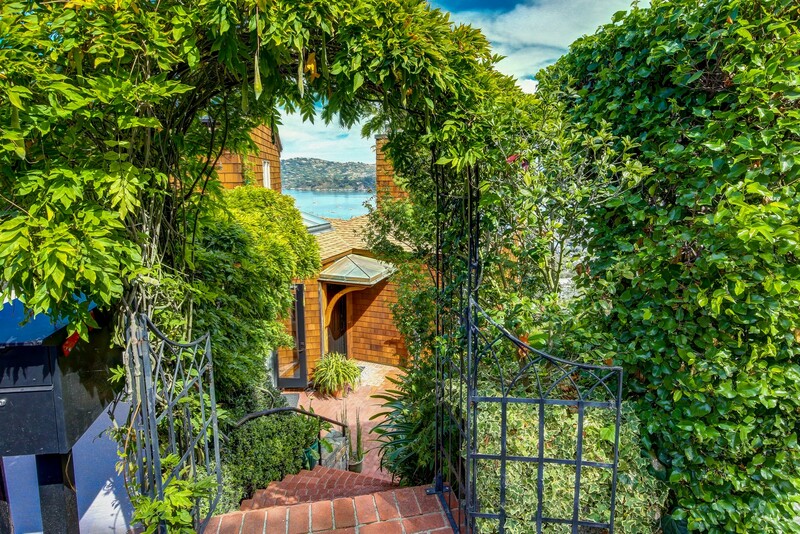 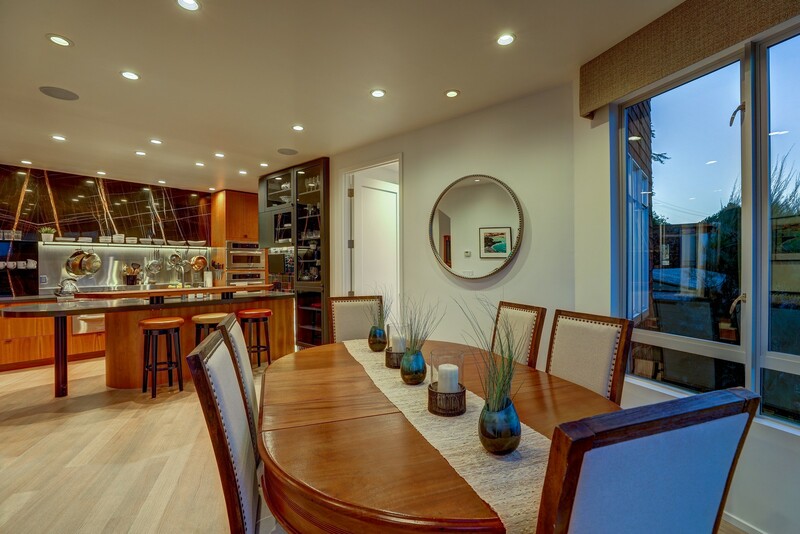 60 Currey Avenue is located mid-hill overlooking Caledonia Street and the Sausalito Yacht Harbor. 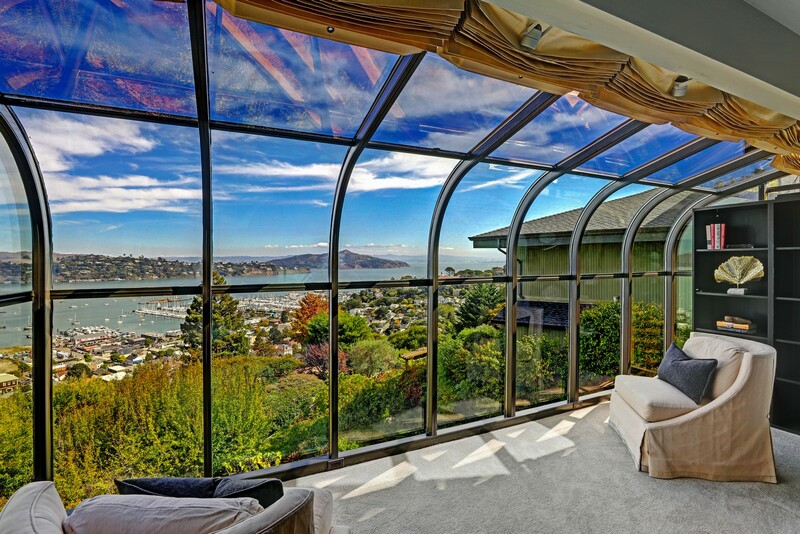 The extraordinary views from Mt. 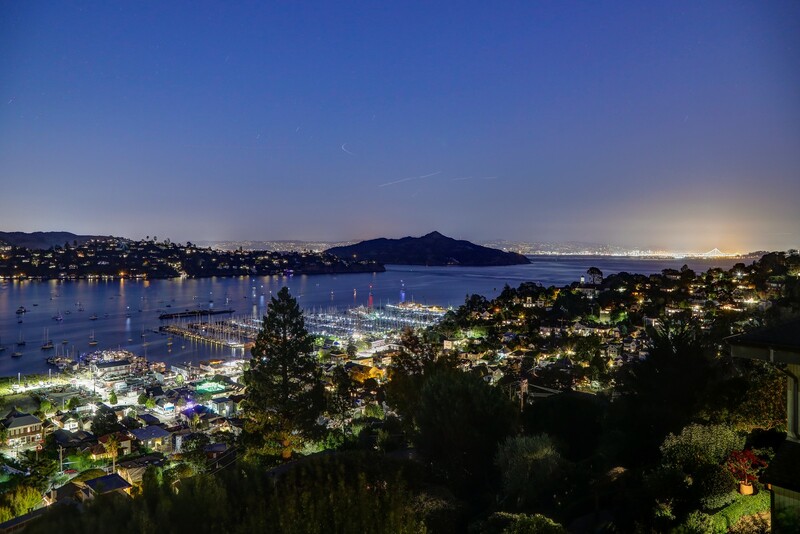 Tam to Treasure Island will enchant you day or evening. 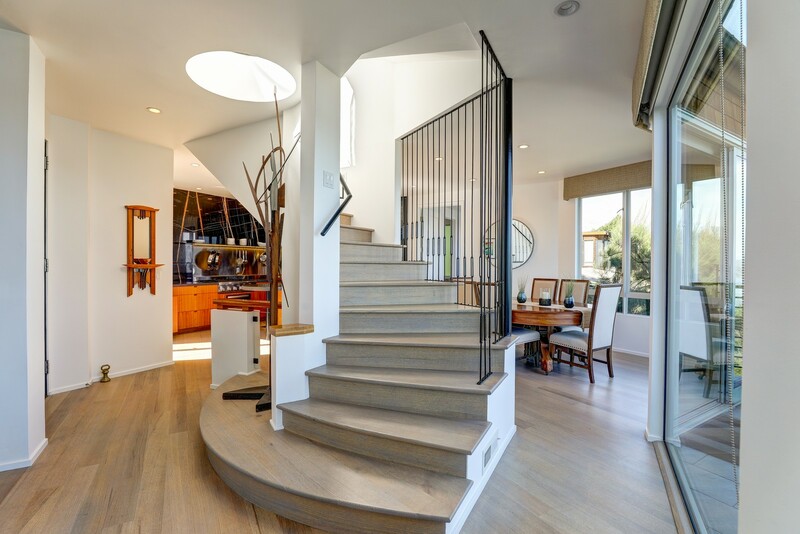 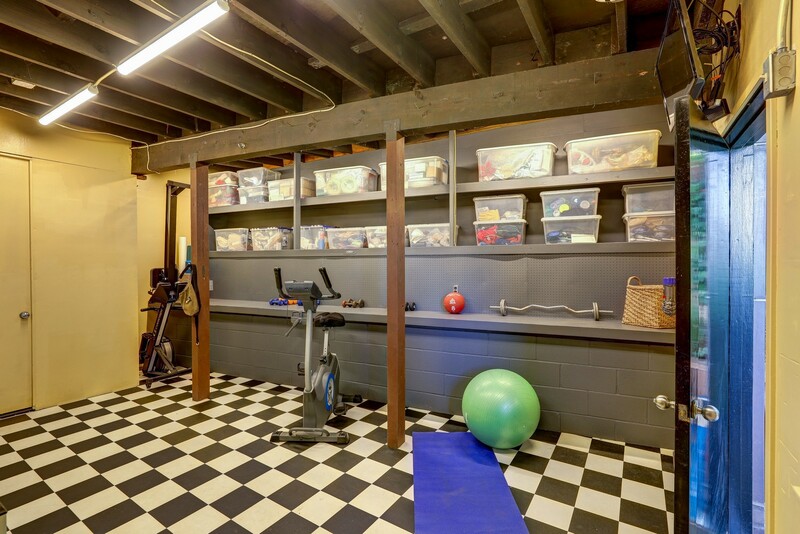 Extensively renovated the property while retaining the original intent of an integrated exterior feel. 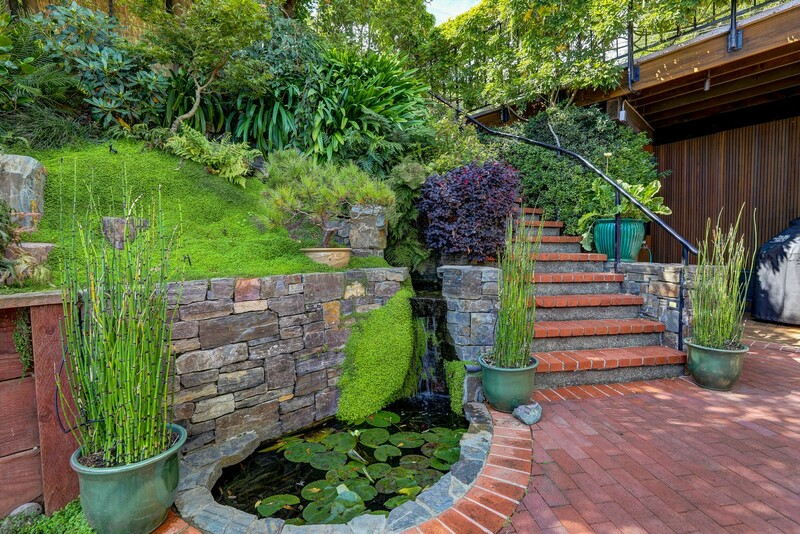 A wisteria covered arched entry gate invites you onto the property delivering you to a large private garden patio complete with babbling waterfall and water lily filled pond. 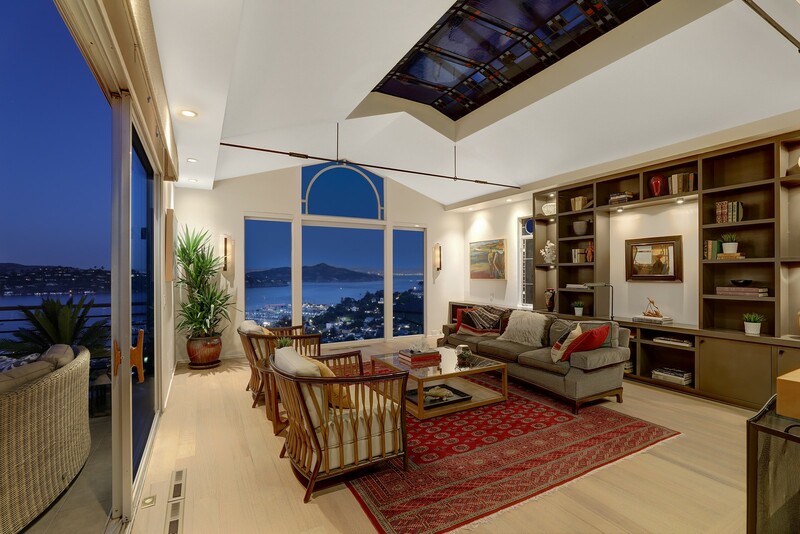 The gabled entry door opens to the center of this lovely home with spectacular views from living room, dining room, kitchen and nursery or home office on the main level. 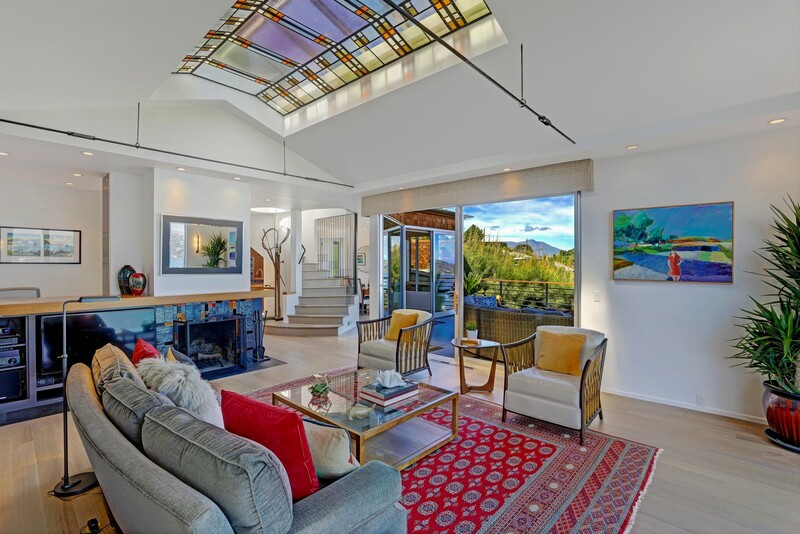 The living room features a 14 foot ceiling height with a 10’x5’ art deco stained glass skylight with two decorative panel access windows. 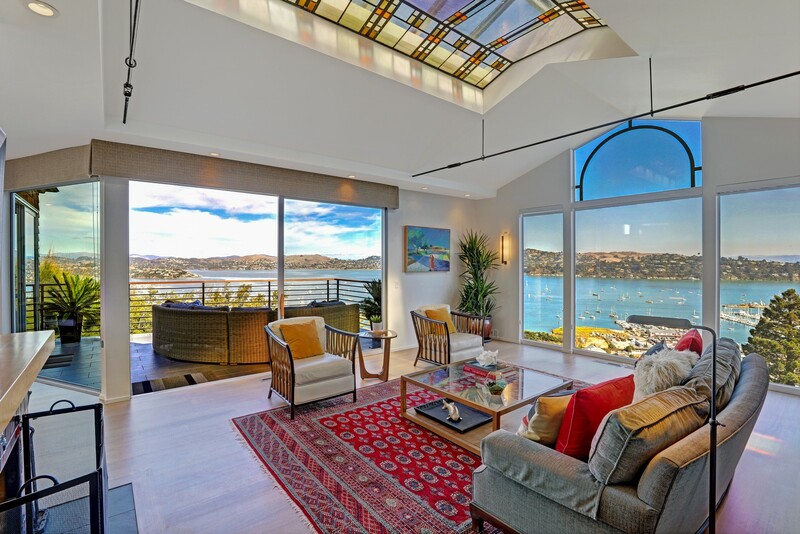 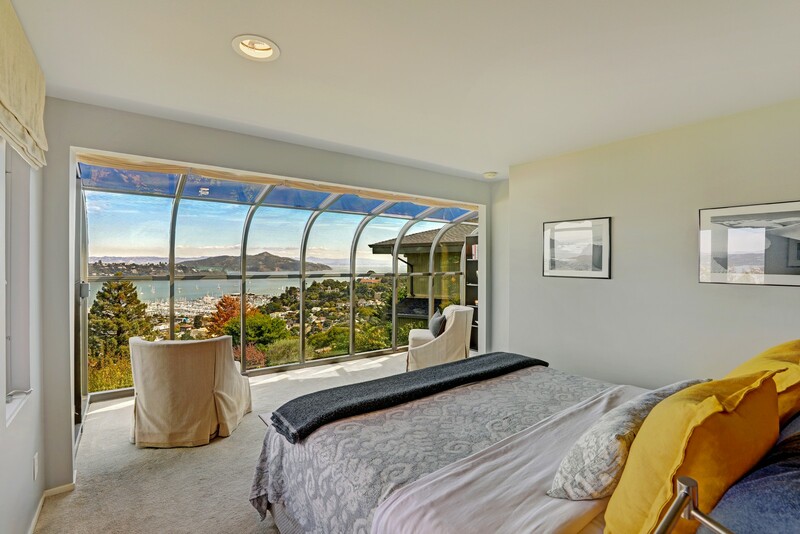 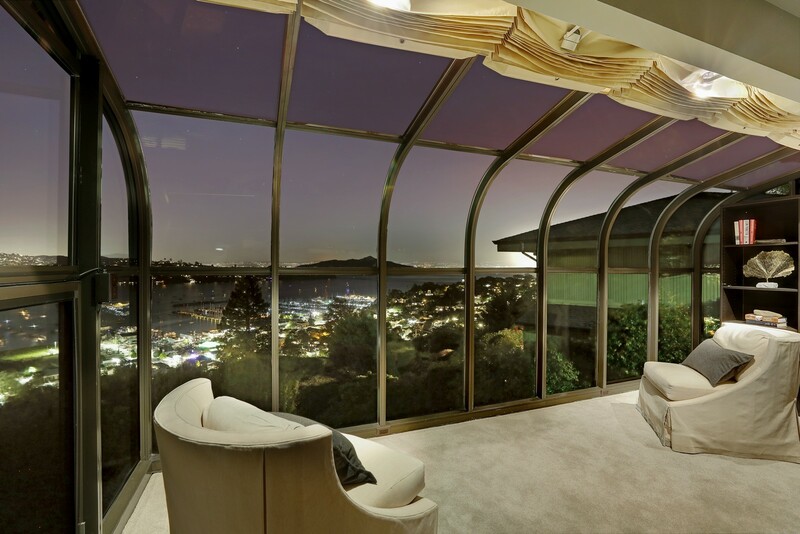 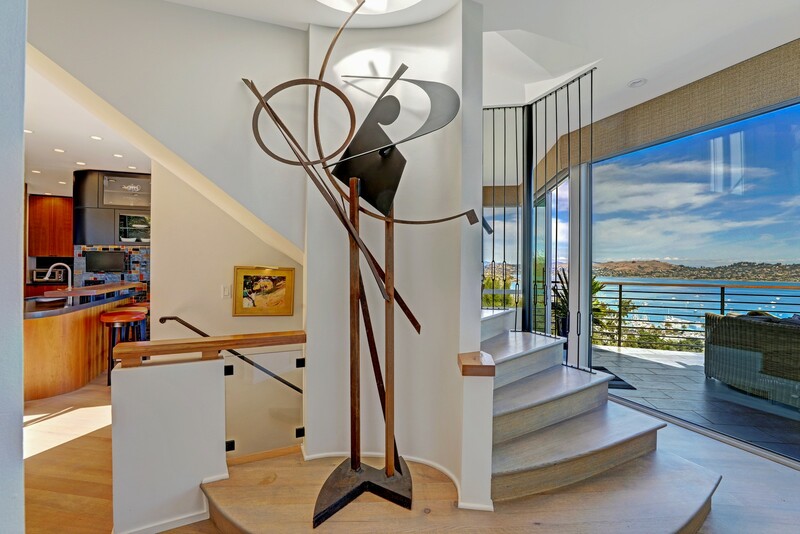 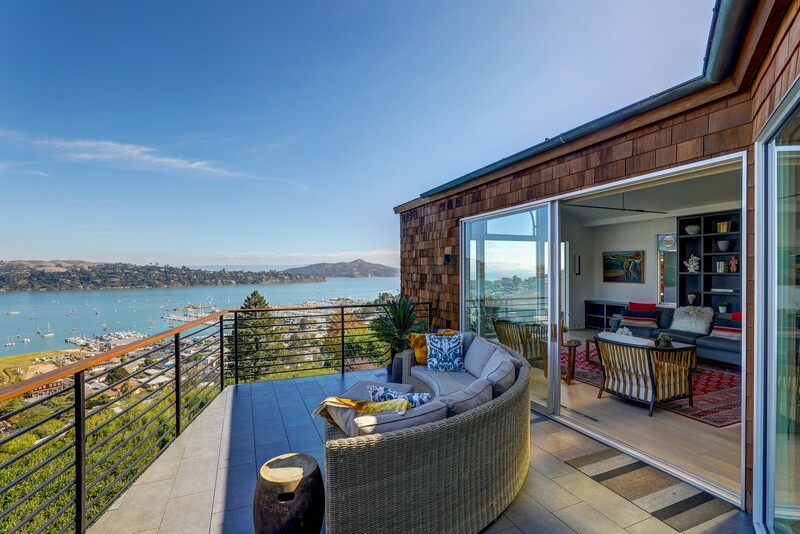 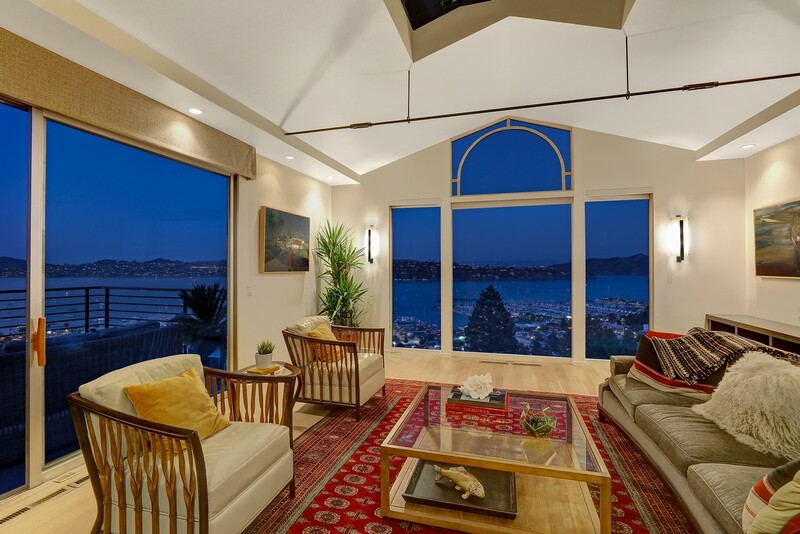 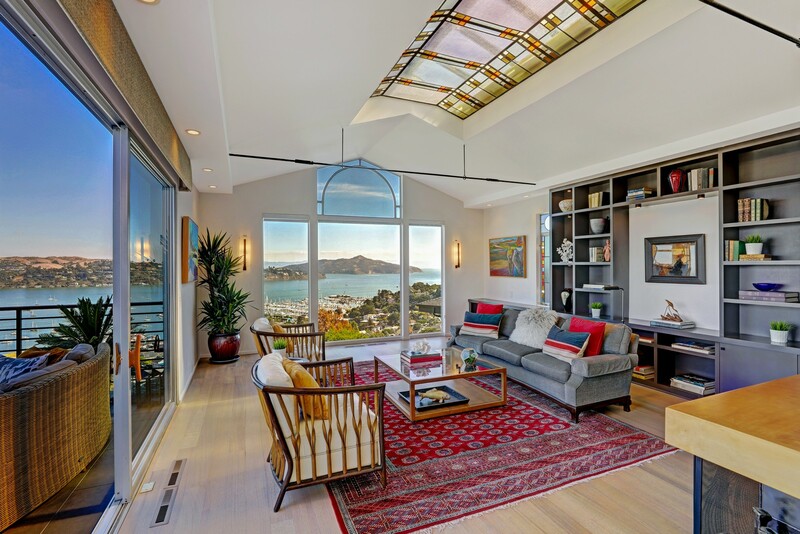 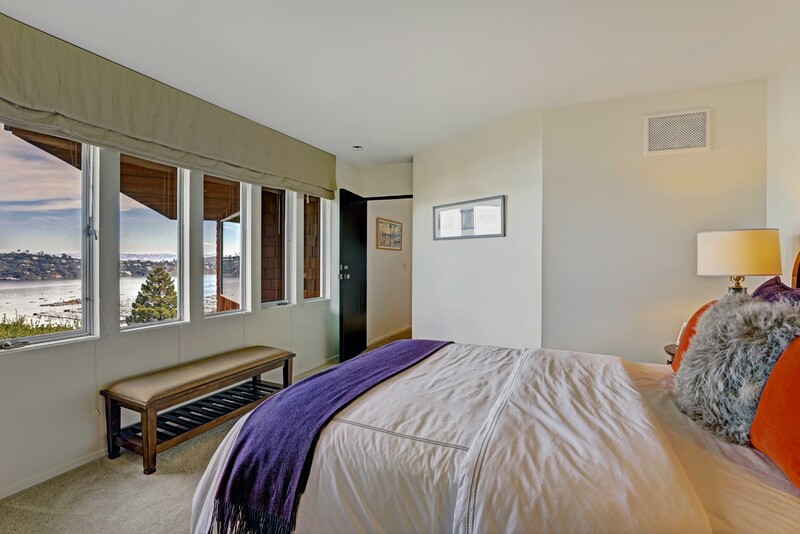 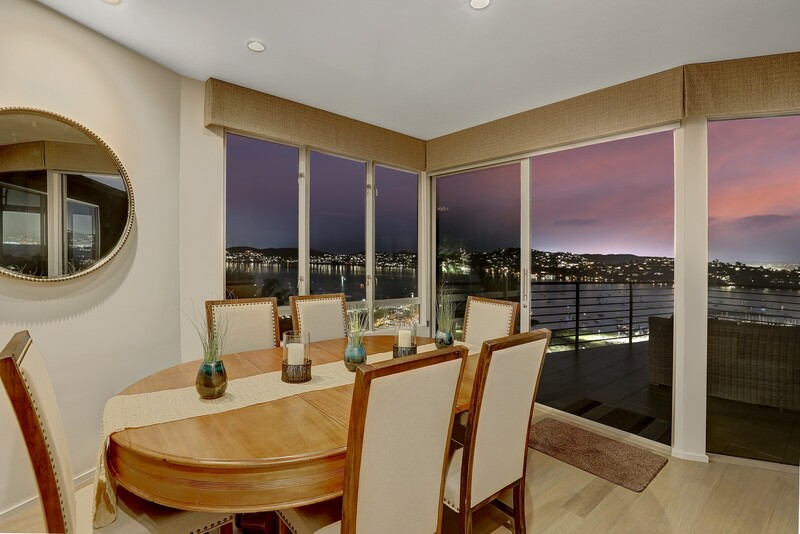 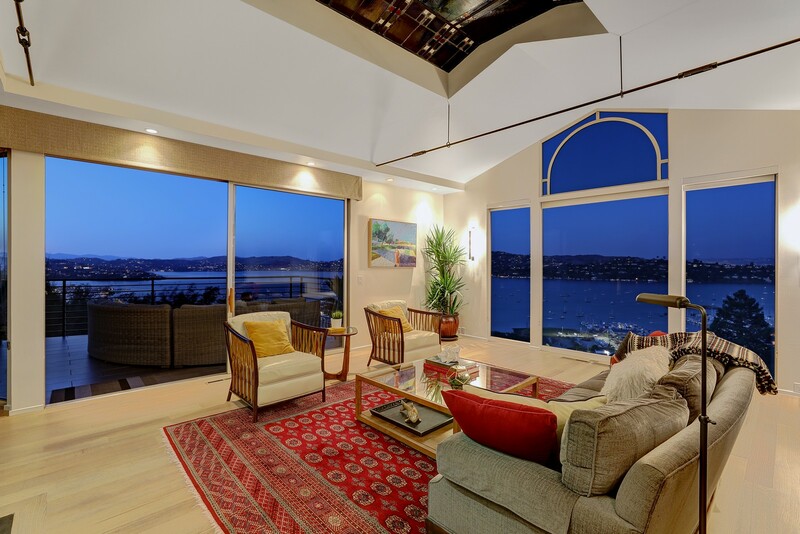 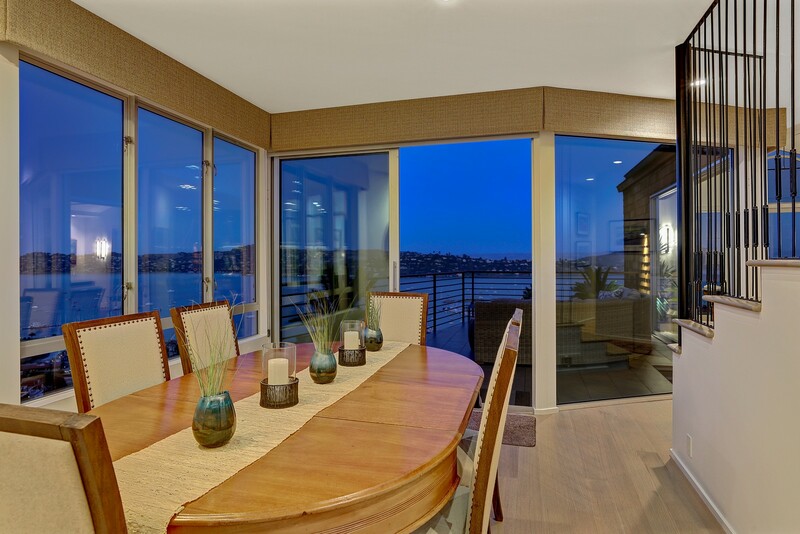 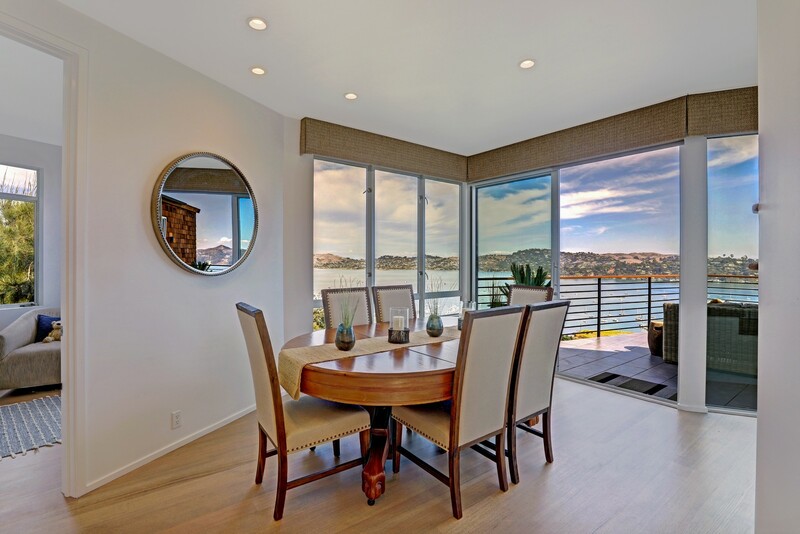 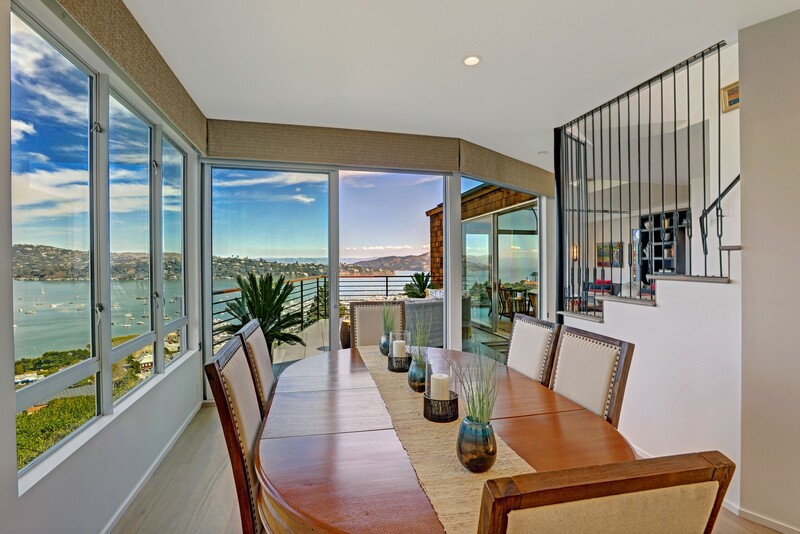 Central to the breathtaking view are the 11’x13’ four panel window looking over Sausalito, Belvedere and Angel Island. 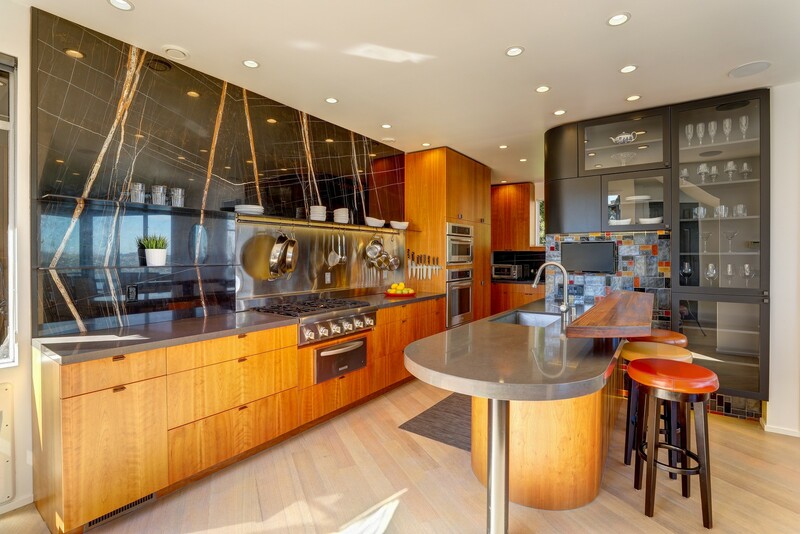 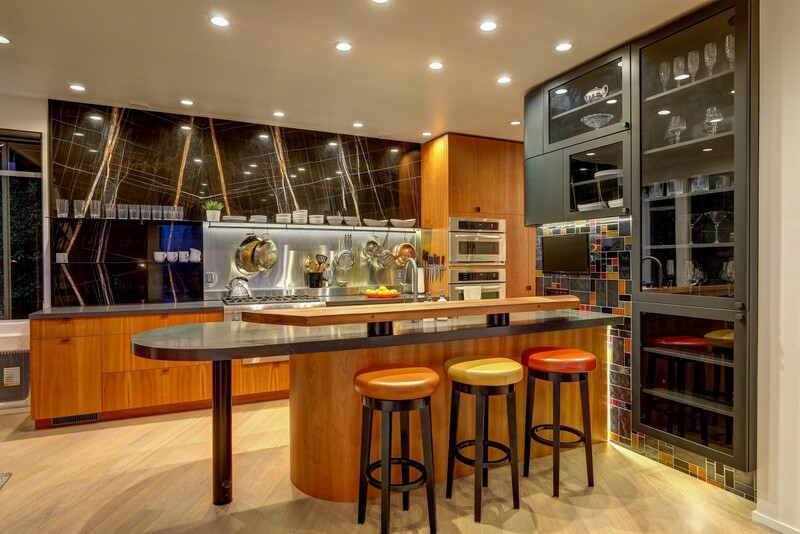 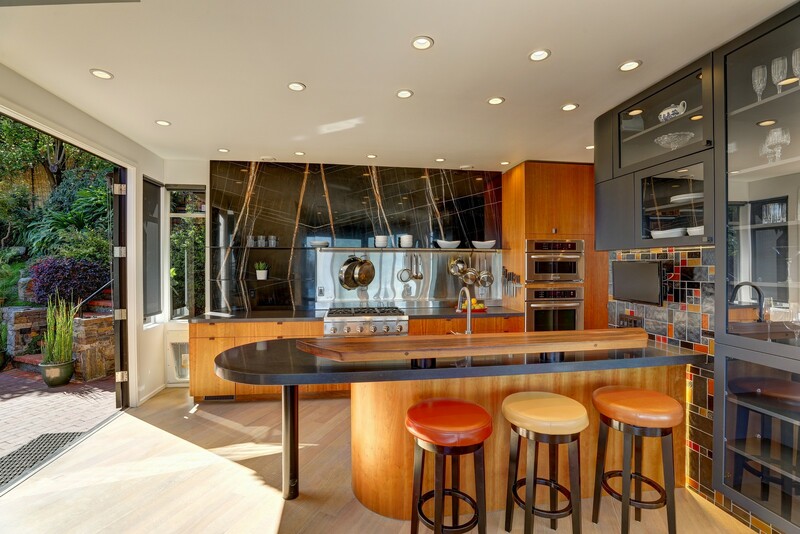 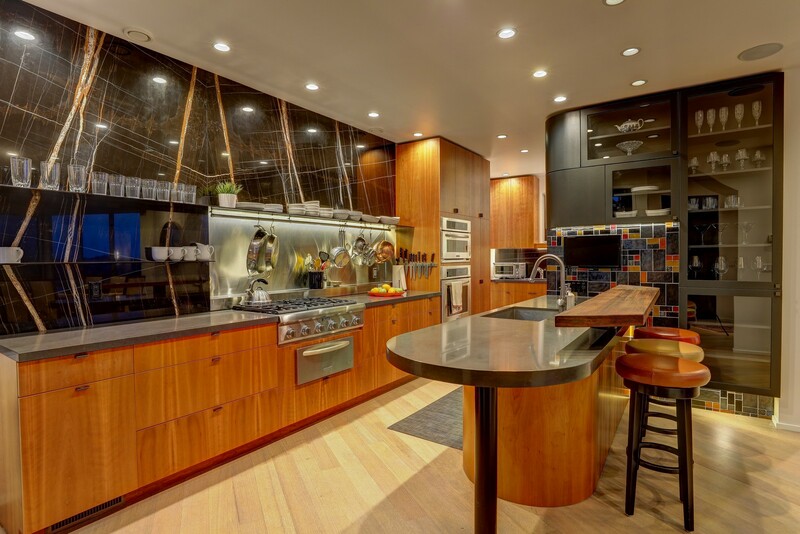 The modern style kitchen boasts of stone counter tops, custom Cherry cabinetry, Thermador 6 burner stove, KitchenAid digital oven, microwave and warming drawer. 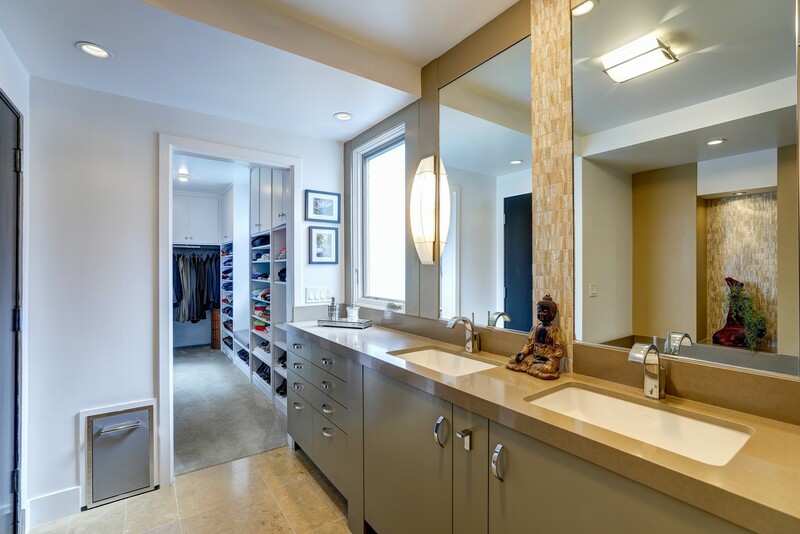 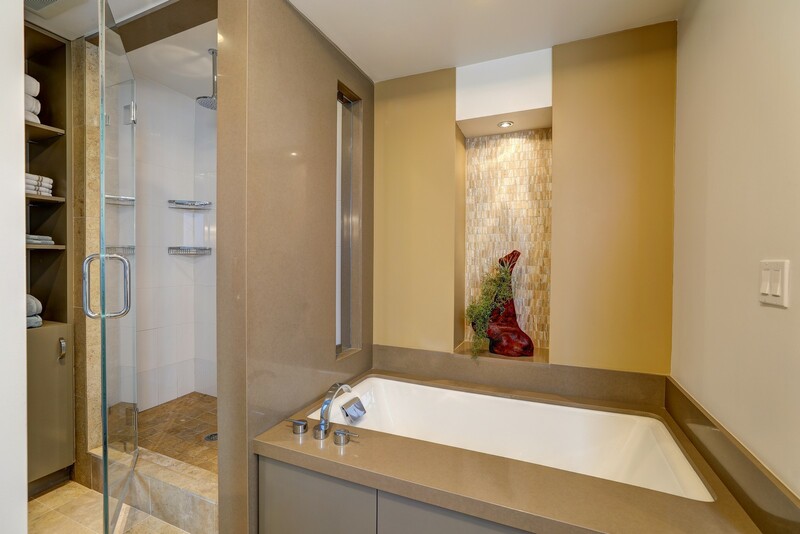 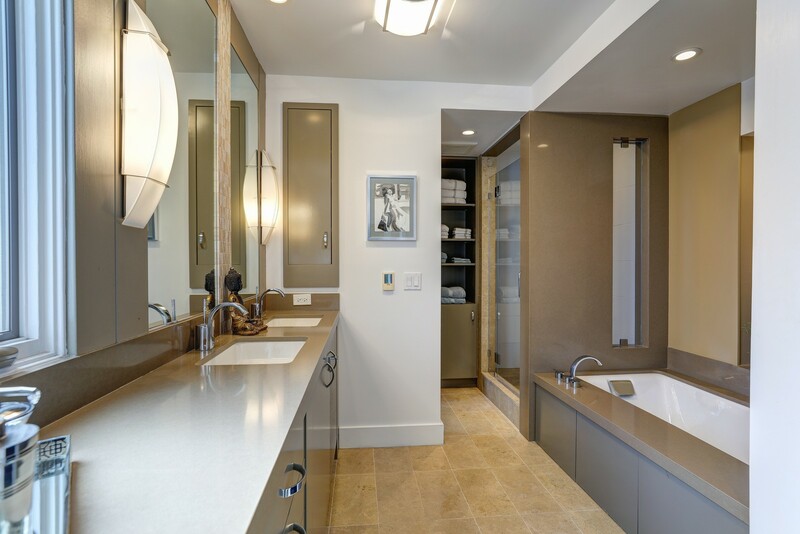 A second light-filled bedroom has amazing views, dual closets and luxurious bath with custom tile, glass shower and built-ins. 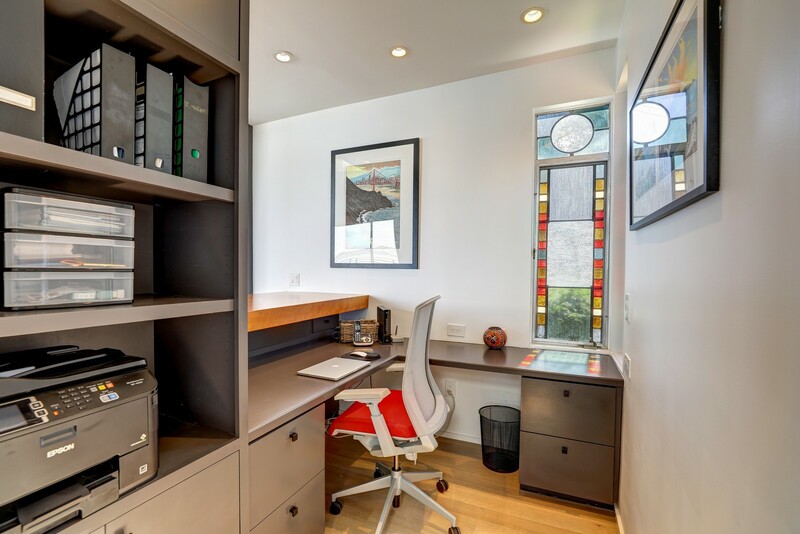 The third bedroom is configured as an Auxiliary Dwelling Unit with a counter top, sink and electric stove plus refrigerator and built-ins. 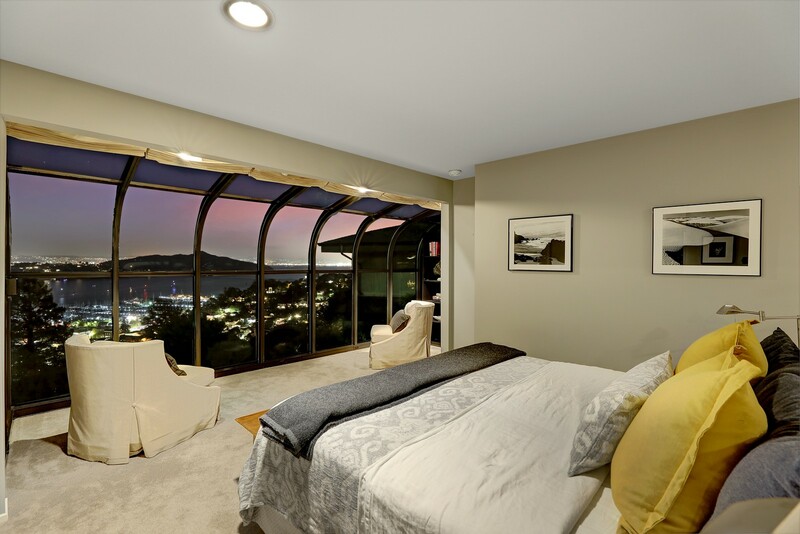 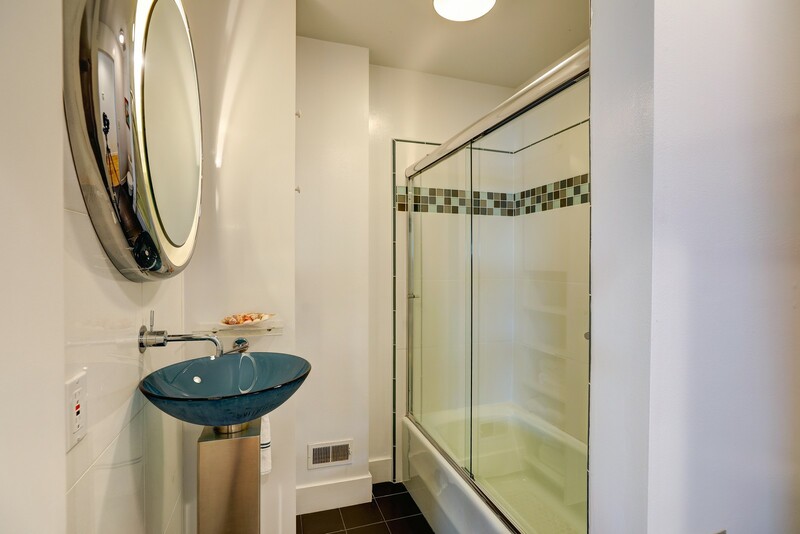 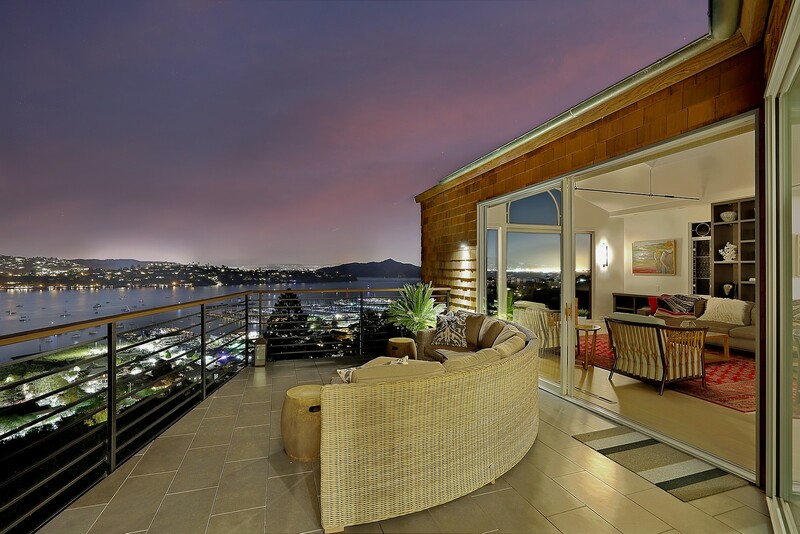 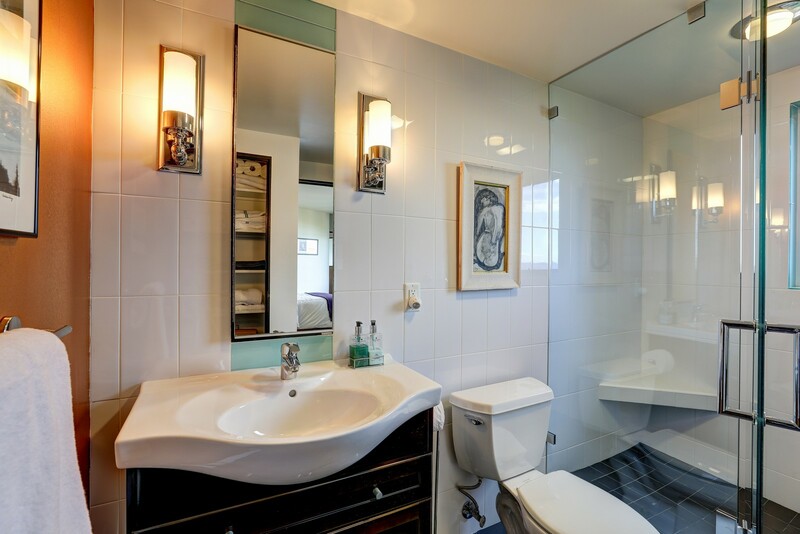 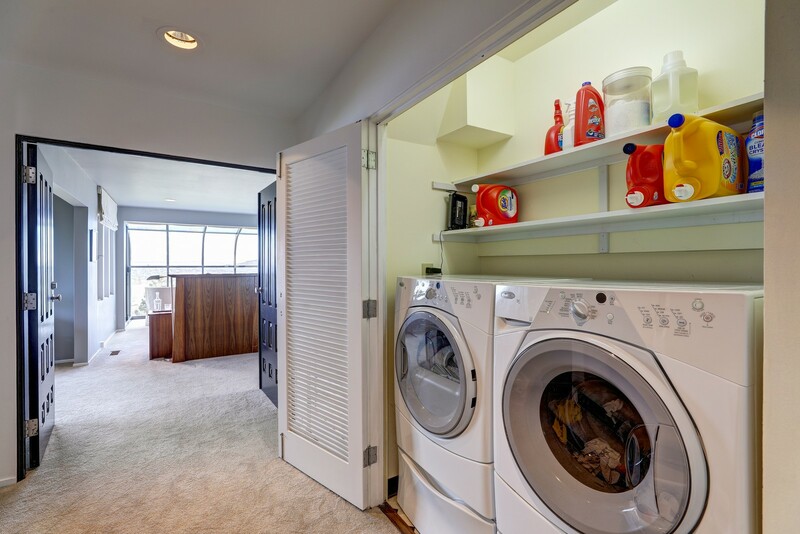 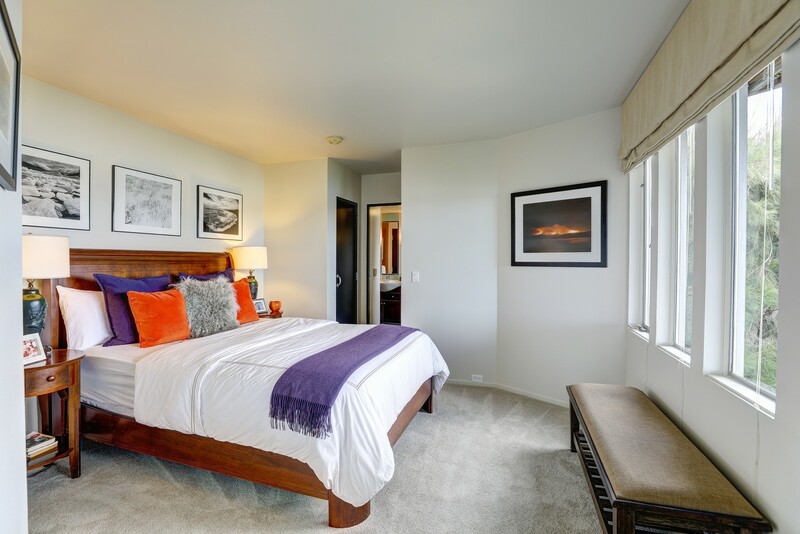 The bedroom or unit has a private deck with big bay views and separate entry from the street. 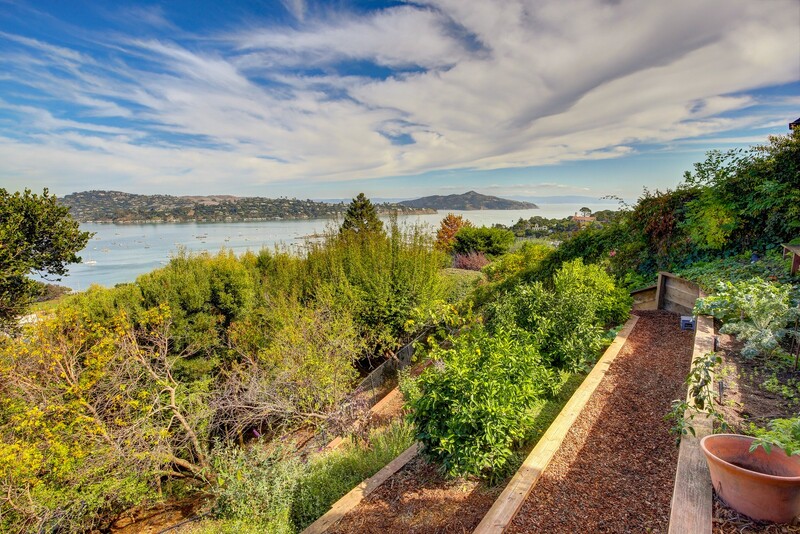 Terraced gardens perfect for growing roses, strawberries, rhubarb, tomatoes, lettuce, figs, Honey Crisp apples, pistachios, Bosc pears, Meyer lemons, limes and tangerines. 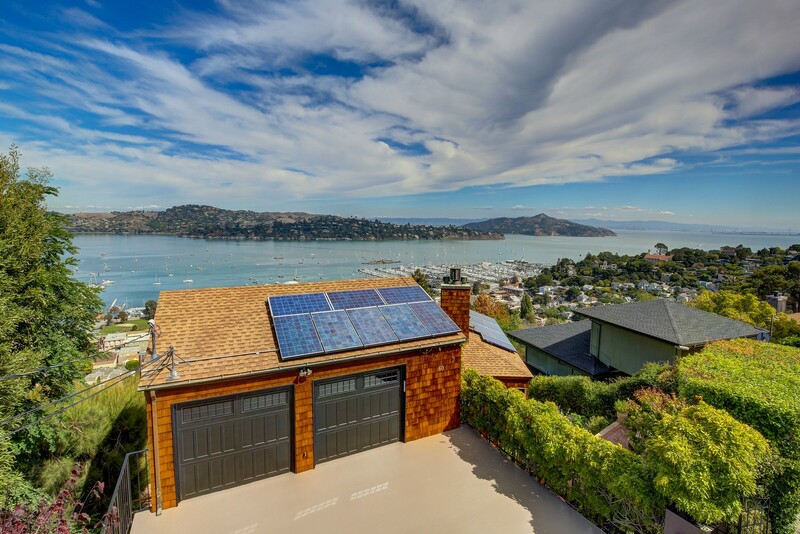 An efficient solar power system is located on the roof of the large 2 car garage and there is 3 car parking on the deck and at least 8-12 car street parking directly adjacent to the property… very rare for Sausalito. 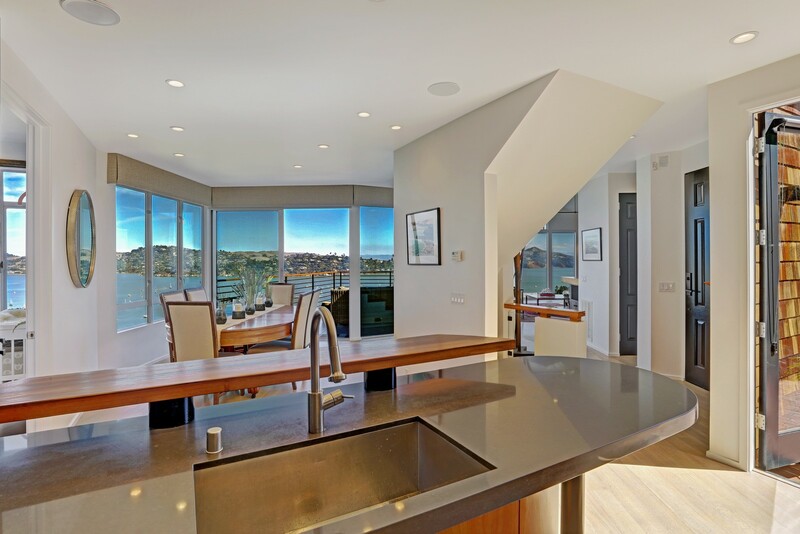 Less than 10 minutes to the first signal light on Lombard Street, San Francisco this is an incredibly easy commute location with transit and Marin Airporter off the 101/Monte Mar Avenue exit only minutes away.